The tool in Dry Brushing is typically a long-handled bath brush with soft, natural fiber bristles. Other options would include exfoliating gloves, a loofah sponge or even raw-silk gloves. The advantage of the long-handled brush over the other options is that the bather can reach body parts not accessible by his or her arm-reach. The middle back is an example of a hard-to-reach area when using the loofah sponge or gloves. 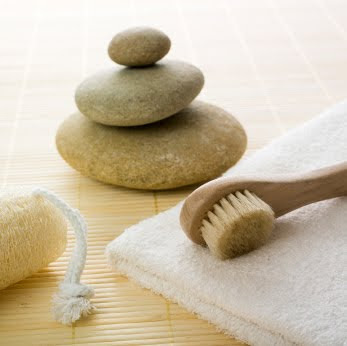 Dry Brushing uses strokes that go towards the heart – aiding in the body’s lymph and blood circulation. Always start with a lighter pressure to avoid scratching the skin or feeling uncomfortable after showering. Deeper pressures can be added over time as the body becomes used to Dry Brushing. Starting at the feet the brush, loofah or gloves are drawn across the tops and bottoms of the feet moving on to the calves and then the thighs. Areas of cellulite or extra fat can be given extra brush strokes. Strokes should always move towards the heart – an upward motion for the lower body and sideways motions for the upper chest and back. The heart is located in the chest to the left of the midline of the body. Strokes across the abdomen should resemble a clockwise motion in the direction of proper digestion flow. Attention can be paid to the buttocks before moving to the back and drawing long strokes up towards the shoulders. Women should use gentle pressure over the breasts and under the arms, especially if sensitivity exists. * The brush or other tool should be washed in warm water with soap after use to clean off any dead skin cells. * Areas of open skin wounds – cuts, scratches and rashes – should be avoided when dry brushing. * Dry Brushing is always performed on dry skin and is best applied prior to showering so any dead skin remaining is washed off afterwards. * The bather can eventually use a coarser brush if desired and skin tolerates the texture difference. * Natural bristled brushes are preferred by complementary medicine practitioners as synthetic bristles are considered to cause microscopic scratches in the skin. Skin types that are prone to dryness will especially benefit from the addition of an oil massage after dry brushing. Very oily skin types will feel uncomfortable with the oil massage and should skip this addition and go directly to the shower after brushing. A plant ester, Jojoba oil matches the skin’s natural oils and won’t clog pores like other heavy oils can. Jojoba oil can be found at local health food stores. Other oils commonly used include almond, olive, sunflower, coconut and sesame.